For a printable copy of the scorecard that you can take with you into the voting booth, click here. Be sure to vote on primary day, June 26, or during early voting June 14 through June 21. If you aren’t yet registered, register by June 5 here. If you aren’t sure where to vote, find out here. These candidates for Delegate and Senate received plus marks in all four categories. Purple Line: Has consistently supported the Purple Line since before its final political approval in June 2015. Now under construction, the Purple Line will run from Bethesda through Silver Spring and College Park to New Carrollton, connecting to 3 Metro lines, 3 MARC lines, and Amtrak. We’ve been fighting for the Purple Line for over 30 years, and we know who has been with us all the way. 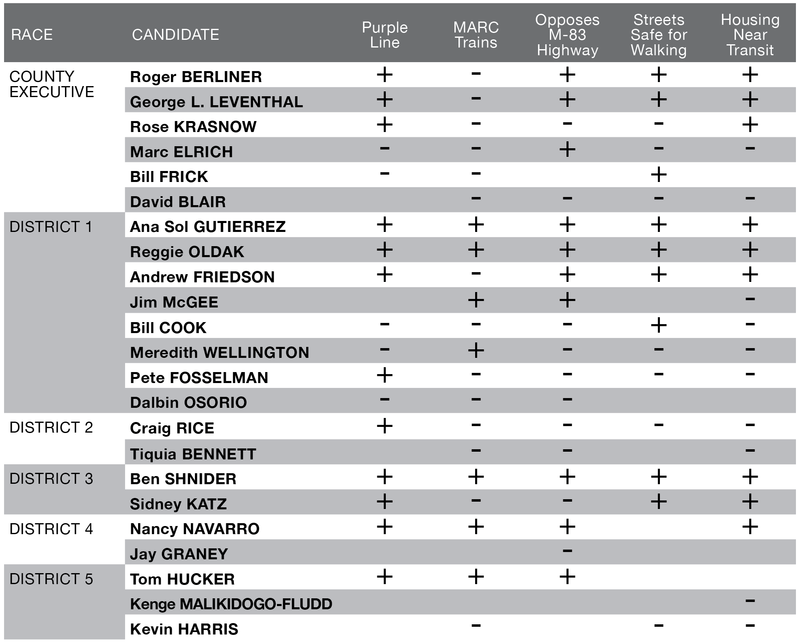 First-time candidates with no recorded position on the Purple Line before June 2015 got a blank. MARC Trains: Would fund MARC trains over more lanes on I-270. All-day, two-way service on MARC is a more cost-effective way to improve transportation in the I-270 corridor than new lanes for cars and buses, and it’s better for the environment, too. Currently, MARC Brunswick Line trains only run for a few hours a day towards DC in the early morning and away from DC in the afternoon and evening, on weekdays only. Opposes M-83 Highway: Opposes building a new highway from Montgomery Village to Clarksburg. The highway would go over parkland and wetlands, increase driving, and cost county taxpayers hundreds of millions of dollars that could be more cost-effectively spent on transit. Streets Safe for Walking: Supports making streets safer for everyone, including by lowering speed limits and making roads narrower. This has been proven to save lives and prevent serious injuries in traffic for people in cars, people on foot, and people on bikes. ACT supports state legislation to allow Montgomery County to lower the speed limit to 20 mph in residential areas. ACT also supports amending the road code so that lane widths of 10-11 feet become the standard in suburban areas, as they already are in urban areas. Only county executive and county council candidates who supported both lower speed limits and narrower lanes without qualifications got a plus. Candidates for the Maryland General Assembly who supported lower speed limits got a plus. Housing Near Transit: Supports more housing in walking distance of rail stations, including downtown Bethesda, downtown Silver Spring, and the future Purple Line station in Lyttonsville. People who live within walking distance of rail stations can ride Metrorail and the Purple Line without having to drive. We also asked candidates whether they think it should be easier for a homeowner to rent out part of their house, even if the neighbors fear that it will become harder to park on the street. Accessory dwelling units can help both renters and homeowners afford to live in close-in neighborhoods near transit. Metro Funding: Supports constant, reliable funding each year for Metrorail and Metrobus. Metro needs this to catch up on decades of deferred repairs. Candidates got a plus only if they consistently supported ACT’s position on an issue. Candidates got a blank if their position was unclear or unknown (except as noted for the Purple Line). Candidates running unopposed in their primaries were not rated. 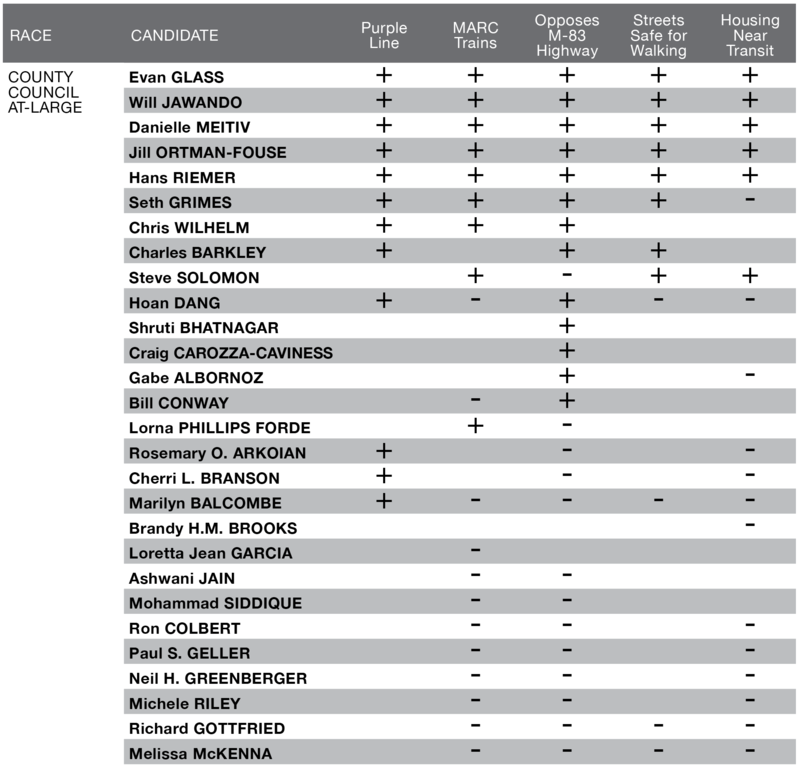 Five candidates for County Council at large are not shown: Tom Falcinelli, David Lipscomb, Graciela Rivera-Oven, Darwin Romero, and Jarrett Smith, all of whom were scored as blank on all issues. Delegate and Senate candidates who did not receive four plus marks are not shown due to space limitations.